Sure, it’s a busy, eccentric label. But Dr. Bronner’s soap works! It’s made with USDA Organic oils, and is Certified Fair Trade. How many brands can say the same? Photo courtesy of Dr. Bronner’s. Evaluating products for my health-based cleaning service means research and field-testing. I’m passionate about healthy homes and healthy families, so it’s organically just part of my job. And my customers have come to expect no less. You can see my product list here. Or, to see my least-toxic specs, read on! With Debra’s help, I learned how to screen products on my own. Not like a biochemist. But enough to protect myself and my customers from potential harm. Debra’s work continues to inform my product choices. My priorities are the same now as they were back then. I seek out the least-toxic and most cost-effective products that work. Of these, I go with what’s widely available. I continually reevaluate the products I use, ready to change course as I learn more. And as more options become available. A never-ending journey! My disclaimer: I carefully screen every products I use. However, I can take no responsibility for inaccuracies, especially when formulas or labels change. So if you need to be 100% sure about my product specs, or the brands I use, please verify my information with experts you know and trust. Every brand I use provides complete ingredient lists to the public, unless noted. A complete list uses specific chemical names, vs generic words like “surfactant” or “preservative”. Complete ingredient lists are not legally required for cleaning products. But they are becoming more important to educated consumers. When I say least-toxic, I mean that accidental exposure is least likely to cause human health effects, in the short or long term. From Day One, I’ve strived to use the least-toxic cleaners that work. Not only for my own health and safety, but also for my customers and their loved ones. And hopefully, for a less polluted earth. I steer clear of products with hazard signals like “DANGER” or “POISON” on the label. Such signals are legally required on products that can cause immediate and severe health effects. That said, I sometimes disinfect with 3% hydrogen peroxide. Peroxide can be very irritating to the skin and respiratory tract. And you don’t want to swallow it. But it’s still less toxic than most other disinfectants. I avoid products with potential long-term health risks. Long-term risks can include organ damage, cancer, or endocrine disruption. Endocrine-disrupting chemicals (EDC) are on my no list. Products that contain EDC include the following. Antibacterial products containing triclosan or triclocarban. Synthetic fragrances. Please note: I use essential oils, except when a customer requests otherwise. Please note: Borax contains two EDC, according to Environmental Working Group. I’ve occasionally used borax for disinfecting, after cleaning up small areas of mold. But will now look into safer alternatives. I completely avoid synthetic fragrances in my work. And won’t knowingly use them in my personal life— meaning my laundry, personal care products, etc. However, I share a washer and dryer with a customer who uses a conventional stain remover that contains fragrance. (Her other laundry products are fragrance-free / toxic-free). In response, I run my own loads through an extra rinse cycle. I haven’t noticed any smell so far, and neither have my chemically sensitive customers. But if you need to know, there you are. Meanwhile, I’ll try to interest the washer owner in a safer product. I do use essential oils, when they happen to be in the products I buy. Mostly almond or peppermint. But essential oils are completely optional in my services. Just ask! I prefer plant-derived ingredients, over plant-based, animal-based, or synthetic ones. Mostly, because plant-derived ingredients work. And to promote a healthier environment for all. Read more here, where you’ll also find a list of products I use. Organic ingredients aren’t easy to find yet, at least in cleaners. But Dr. Bronner’s Pure Castile Soap, and Spectrum Organic White Distilled Vinegar, are two exceptions. Both happen to be the two products I use most. Certified Fair Trade brands aren’t easy to find either. 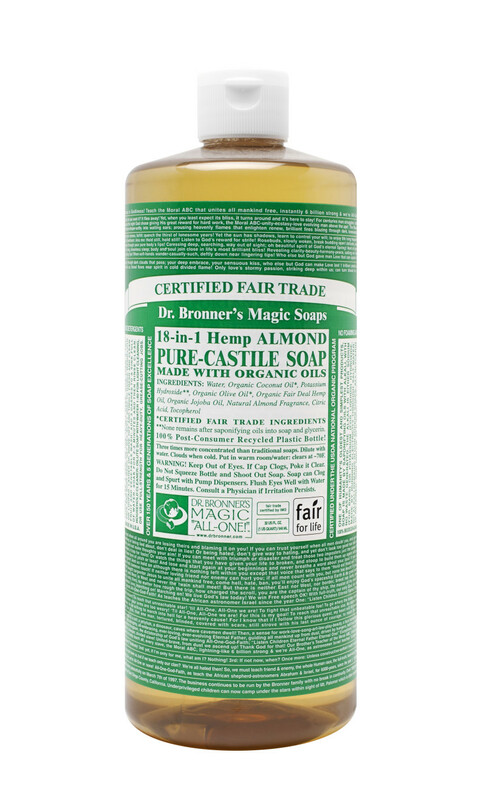 But Dr. Bronner’s Pure Castile Soap is one exception. And I clean almost everything with it! All the products I use are free of animal testing. The commercially formulated products are certified by the Leaping Bunny, PETA, or both. If you can have a safe product without cruelty, why go any other way?